Camp Turtle Rock offers a recreational swim program to all campers 1 to 3 times per week. Campers will enjoy the heated swimming pool while playing their favorite water game or activity. This program is designed to provide a safe environment for the first time swimmer, as well as, the advanced Jr. Lifeguard. All campers are swim tested during the first week of camp. 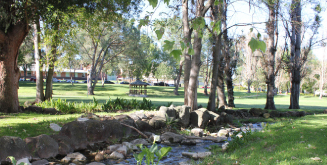 Campers will build their confidence and develop skills under the direction of the Conejo Park and Recreation Red Cross Certified Water Safety Instructors and Lifeguards. This beautiful swimming facility is on location at Cal Lutheran University. Under the direction of our trained staff, campers feel the excitement of rock climbing on our state of the art rock wall. All climbers will receive instruction and have the opportunity to climb every week for campers that attend Monday through Friday. The climbing wall has four separate routes with dinosaur fossils to find on their way to the top. This is a camp favorite for all ages. Craft projects provide a great opportunity for all campers to explore their creativity. An Arts & Crafts Specialist and Group Counselors will guide campers in age appropriate projects using such materials as paint, clay, lanyards, tie-dye, yarn, wood and leather. Imagine touching live Sea Stars, Sea Anemones or an Octopus in our mobile marine tide pools without leaving the Cal Lutheran University campus. Campers will also enjoy learning in a fun environment while participating in other hands-on activities. The natural creek that flows through camp is home to various crayfish, pollywogs and frogs for the campers to catch and study. Fossil finds, archeological digs, gem mining, Indian arrowhead discovery and gold panning are some of the surprises within the Nature Program. Camp Turtle Rock prides itself on its creative and exciting calendar of events and activities. Some of these activities may include: Carnival, Crazy Hat Day, Greek Olympics, Talent Show/Star Search, Backwards Day, and Crazy Hair to name a few.